Classic Pearl and White. Perfect contrast of colors and an all time favorite across the country for all plastic combinations. The new and improved swim bait from the makers of the matrix shad. The New Vortex Shad is a 3.75″ swim bait designed with a new dorsal fin showing anglers exactly where hook place meant should be also with a notch in the tail giving extra swimming motion. Also the tail is shaped in a V and is nick named the V-Tail. All tails are segmented to give strong contrast of colors between the body and tail trigger more reaction strikes from those trophy fish. Check out all the exciting episodes of Dockside TV right here. Catch a fish tagged with a Matrix Shad ID tag and win! Dockside still offers the best professionally guided Louisiana fishing trips! 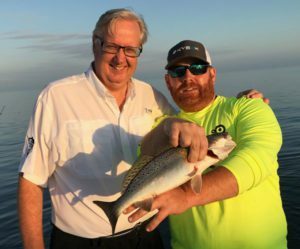 All inclusive full day charters fishing the shores of Slidell, New Orleans, and Biloxi marsh for monster Redfish, gator Trout and more.